On September 3, 2010 the United States Attorney announced the indictments handed down by a grand jury in Tacoma, Washington, against members of Disarm Now Plowshares, which came ten months after their plowshares action in which they entered Naval Base Kitsap-Bangor in the early morning hours of November 2, 2009, All Souls Day, with the intention of calling attention to the illegality and immorality of the existence of the Trident weapons system. 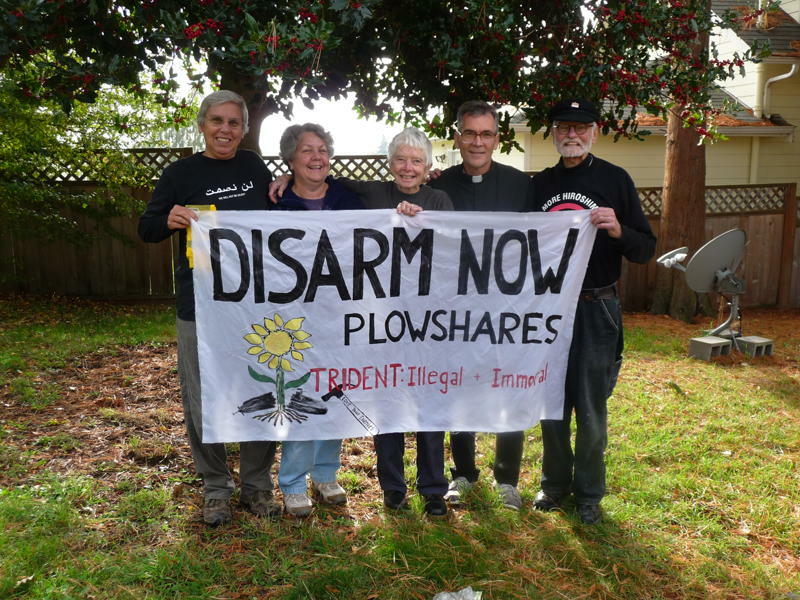 During the action they held a banner saying…“Disarm Now Plowshares : Trident: Illegal + Immoral”, left a trail of blood, hammered on the roadway and fences around the Strategic Weapons Facility – Pacific (SWFPAC) and scattered sunflower seeds throughout the base. They gained entry to the secure nuclear weapons storage facility known as Strategic Weapons Facility-Pacific (SWFPAC) where they were detained, and after extensive questioning by base security, FBI and Naval Criminal Investigative Service (NCIS), cited for trespass and destruction of government property, given ban and bar letters and released. Moving to Kitsap County in 1983 to join the Ground Zero Center for Nonviolent Action, Greenwald participated in several nonviolent actions at the Trident Base and is currently on probation for “crossing the blue line” in August 2009. She currently lives in Tacoma and works with the Tacoma Catholic Worker. The fact that five unarmed, nonviolent peace activists could enter a deadly-force, high-security installation without being detected exposes the lie that nuclear weapons make us secure, Bichsel said. Kelly, who has spent more than six years in prison for anti-war actions, said the abolition of slavery, an institution many people thought would never end, gives him hope that humans will turn away from nuclear weapons. The abolition of slavery required leadership, Kelly said. The same kind of leadership from the Unites States will be required to abolish nuclear weapons. Visit disarmnowplowshares.wordpress.com for complete information, including biographical statements and links to the work of the Disarm Now Plowshares.